What’s that in that tree? 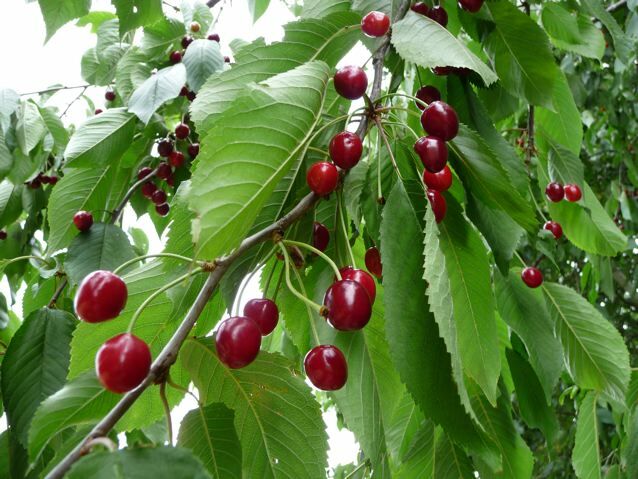 Cherries – billions of them! Never being without a bag, I’m a dog walker remember? I stood and picked a dog bag full, about 3lbs in weight. I looked as if I was a member of the cast of the recent promenade version of Macbeth the students did here with my hands stained red with cherry juices. At home, I washed and sorted my cherries out. Then I washed the fruit, put them in a pan to heat up and gently cooked them till the skins had softened. Don’t add sugar till the skins are soft. Added the sugar, heated it till it dissolved, completely, added the juice of a lemon and a little commercial pectin and then brought it to a roiling boil (I love that word!) and it was ready in about 7 minutes. I use a sugar thermometer to monitor the temperature, usual setting point is 104 – 106 C. Test for a set by putting a teaspoon of jam on a cold saucer, turn off the boiling jam while you wait to see if it has set enough. It should wrinkle slightly when you nudge the test spoonful once cooled. If it hasn’t then turn the heat back up again and bring it up to temperature once more. Tip: the time to stir is when you are slowly dissolving the sugar, once you start boiling the jam, don’t stir as it stops the jam coming up to temperature quickly which is what you want, in order to have a nice fresh tasting jam. This first batch pictured here was made with 50 percent sugar to fruit weight and was destined to go in the fridge and be eaten quickly. I wanted a tart jam that really tasted of cherries. I made a second lot later with 1 kg of sugar to 750 g fruit that was hopefully to be kept longer. But I was guessing here as to what the correct ratio is. Edit: I have done a little bit more research and the most commonly advised proportions are : 60 per cent sugar to 100 per cent fruit weight. 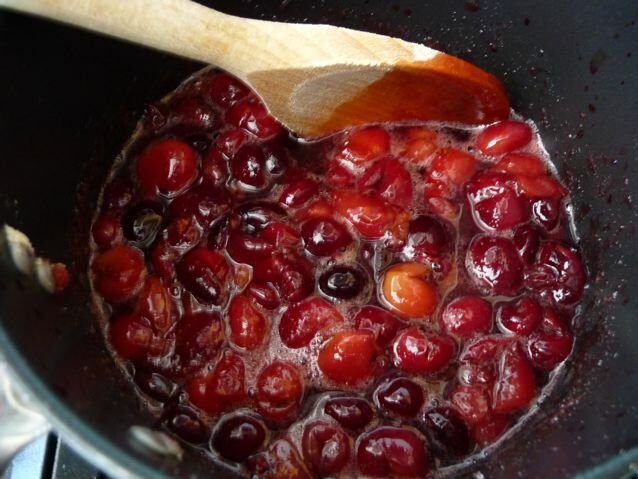 If the cherries are sweet then add a tablespoon of lemon juice for each kilo of fruit. You will probably need to add some pectin, either home made or commercial. Suggested proportions and lots more useful information can be found here where I found it on the Allotment Vegetable Growing site. And here it is for breakfast on some of that soya linseed bread that makes fabulous toast….an all time favourite Dan Lepard Guardian recipe. 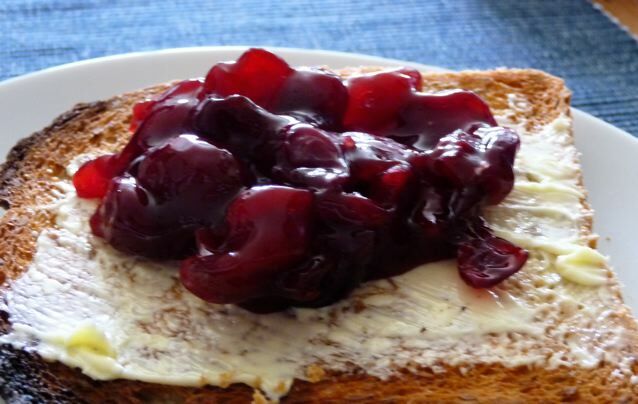 This entry was posted in Bread, Dog Walks, Plants and Trees, Preserves and Cordials, Pure Joy, Wild Food and tagged soya linseed bread, wild cherry jam on 02/07/2010 by Joanna. I was watching a cherry tree locally and wondering whether to pluck up courage to ask the householder if I could pick enough for a pie. Then they disappeared overnight – I can only assume the birds took them at the point of perfection. That sounds like a serene activity, Joanna. 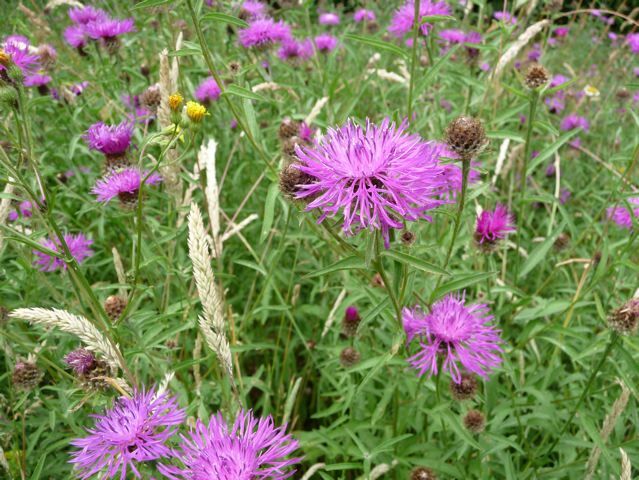 And just looking at your sticky pots of loveliness makes me want to go walking in the Cotswold wilds myself with a bag. What a wonderful find Joanna. Have you been back for more? Just wondering if you just hit lucky before the birds demolished the lot. The cherry jam sounds delicious. Every cherry tree in the woods seems to be groaning with fruit, there are a few song thrushes around and the usual crows and so on but generally a bit quiet on the bird front, not sure why. The place where most of the trees are, is a piece of woodland and fields, part of which had pre-fabs on during the war. These have now been taken down but I think maybe some of the cherry trees were planted then. Some of them are huge. Yum. I love cherries as well and stumbled on a cherry tree in one of the neighbourhood’s side streets, but all the bottom branches are cut-off, so one would need a ladder to pick up any cherries. Looks like most (all?) of them are ending up falling down and being walked on. Zoya, I’ve just come back from visiting a friend outside whose house in a cherry tree with fruit all over the ground, just like the one you describe, I think it’s very common that cherries and other street treees have their lower branches removed, presumably to make space for homo sap to walk along in comfort. I don’t know how the trees in the cherry orchards of yore were managed….in the same vein, I didn’t connect the lime (linden) trees on the roads with the huge ones in the parks with branches sweeping down to the ground until the other day, their silhouettes look so different. I have just found some cherries today and I am going to try your recipe. One extra thing I will try is to crack a few of the stones and add the central soft kernel. If memory serves me right that adds a nutty almond flavour to the mix. Hi Dill, thanks for visiting! My Swedish Aunt cracks the stones and adds the kernels too. 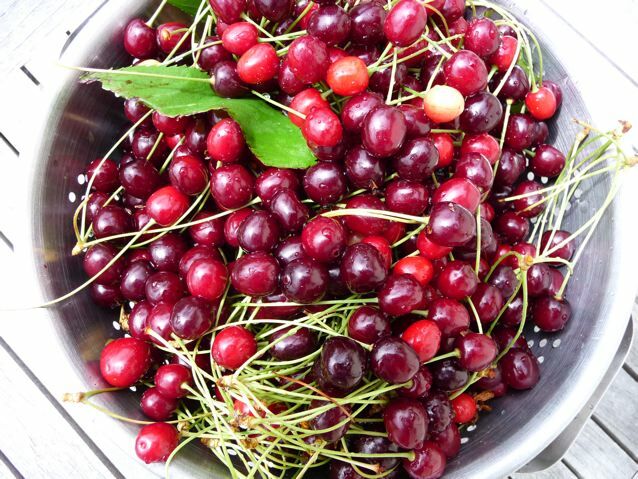 The taste that you are after, she says, is from the cyanide content, present in cherry, apricot, apple pips etc so don’t use too many :) I found that the wild cherries have a bit of that taste anyway, but you are right it is delicious. Apparently, one of the things that cyanide does, in small quantities, is inhibit your cough reflex when you have a tickly cough, hence the use of cherry flavoured cough mixtures traditionally. There you go! How interesting about the cyanide… That will be my interesting fact for the day to tell my husband tonight. I made three more little pots yesterday, as the birds and the public still haven’t connected with my three big trees still full of fruit, the fruit has now turned almost black, I picked a quick dog bag full, came home, decided to cook them first to see if the de pipping was any quicker that way. I can report it takes the same amount of time, only less juice squirted up the walls. This time I used a ratio of 83% sugar weight to fruit weight. Used less pectin and a little water in the fruit as well. Cherry jam sets off so quickly, six minutes of boiling and it is done. I didn’t know that about cyanide – how very interesting. If something tastes very strongly of bitter almonds that is usually an indicator of the presence of cyanide compounds…. I know you have to be careful with things like uncooked elderberries too. 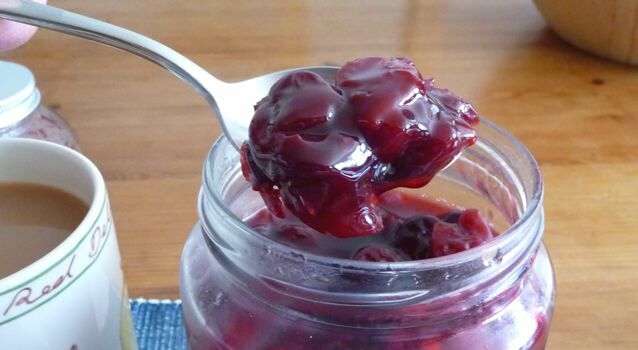 I found myself becoming totally envious of your cherry find and jelly! Growing up we had sour cherry trees in our yard and I loved them- I ate them right off of the tree! Now they are SO expensive, even at the pick your own farms, that I am rather parsimonious with them- only making a couple of pies a year to feed my husband and son’s cherry hankerings. I would love to come across free cherries- I would make soup and cake and jelly and pie and then just sit down and eat a bowl full of cherries! It’s quite tricky to judge the right quantity of pectin to go in with them. I haven’t found anyone who says how much they need. Too much and it sets too hard, too little and it stays runny. I would be interested to hear how you get on. I reckon one could make cherry brandy or cherry gin following recipes for sloe gin of which there are loads around on the net :) Good luck with the jam Gita! Christine, it was very exciting; now ripening in the same woods are some little ‘cherry’ plums, but not as many as last year, I think these things vary from year to year. This was definitely the year of the cherry down there…. When moving into our new house I noticed a badly damaged tree that had been hit by the bulldozer while land was being cleared. As a matter of principle I babied this sapling and was determined to save it. Two new trees spring up, about 7 and 14 feed in height now. The original tree is about 20 feet and in its 9th year. now. This year all three produced beautiful little buds followed by what I thought looked like tiny little cheeries. I researched them on the internet and took a chance and picked them. I followed a recipe for jelly adding more than what pulp was called for. Surprise!!!!! It turned out to be the richest and tastiest jam I have ever made. I made three batches, 24 jars, 6 weeks ago and its all gone. I gave some to family and friends and they all asked for seconds. 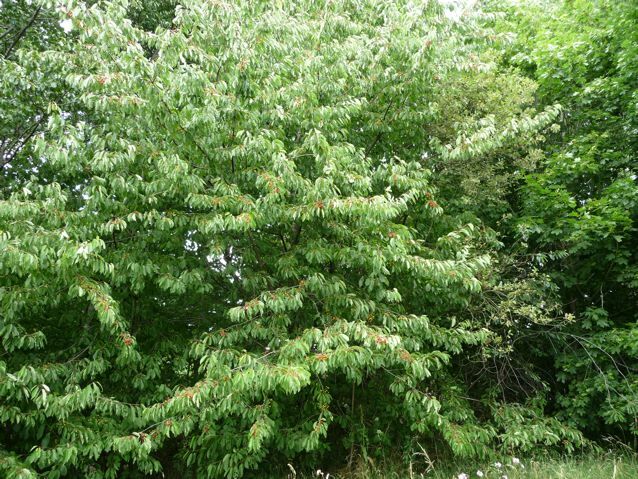 My question is, can I expect cheeries every year from now on or do some wild trees only produce every few years? What a lovely story! Joy, I am not an expert in fruit trees, merely an enthusiast ;) Are you writing from the UK? This year there was a particular good fruit season in the woods and parks and in my garden. I suspect it was to do with the prolonged cold winter and the fact that the trees didn’t blossom early, like they do in a mild winter, ( and then get hit by frost) but blossomed when the insects were probably around to polinate them and hence the trees were so heavy with fruit. Maybe one should keep weather records. Day and night temperatures, and note the days the trees blossom and see if there is a pattern. I agree that the little cherries make the most wonderful jam. Some fruit trees have a habit of fruiting every other year, so they have a big crop one year and hardly any the next. Personally, this was the first year that my little pear tree fruited and it is now 5 years old but it was only a maiden when I put it in, so that’s probably about right. I would love to have room for more fruit trees.